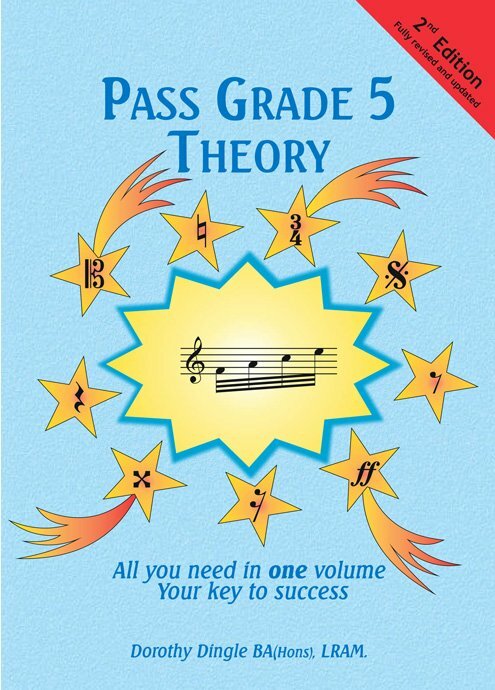 Pass Grade 5 Theory provides a comprehensive introduction to music theory which is accessible to students of all ages from 9 upwards. Primarily intended to meet the needs of students working for the ABRSM Grade 5 theory examination, it also contains a wealth of useful material for students of Music and Music Technology at GCSE & A-level, including those who may not have had any formal musical training prior to starting their courses. The author has extensive experience of teaching music theory both in schools and in private practice. This book is the product of that experience and the material in it has been used successfully with students of all ages from Year 5 to adult. It assumes no prior formal training in music theory. Hand in hand with Pass Grade 5 Theory Answers this fully revised, updated and even more comprehensive 2nd edition (2018) provides all the material etc etc provides all the material needed to allow a student to pass the ABRSM Grade 5 Theory exam. Students who require a slower introduction to music theory with more reinforcement of the basics before tackling the more advanced work required for the Grade 5 syllabus may wish to consider using the companion volume, Pass Grade 3 Theory, first. Look inside - click an image! If you have any questions please contact Chamberlain Music directly: here or 01428 658806. Written in a very approachable manner, the improvements in this 2nd edition make an already excellent product even better! The diagrams and explanations were really helpful and I got a distinction. This book's fantastic! As well as helping with Grade 5 theory it's explained so many things for A-level music. Having been afraid of Grade 5 theory for 20 years, this book finally gave me the help I needed and I passed the exam with distinction! I really like Mrs Dingle's theory book – it explains things in a way I can understand. I wish this had been available when my two older children needed to pass grade 5 theory – it's been wonderful for my younger daughter. This book assumes that the student has not studied music theory before. 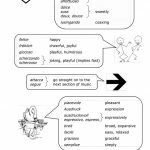 Each topic is covered in detail from first principles and each musical term is defined when it is introduced. There are 23 Units in the book. The order has been carefully planned in order to ensure that the student first gains a thorough understanding of the basics of pitch, key and rhythm. The topics of transposition, basic chord structure and cadences, and how to produce an effective composition then build on these foundations. Anyone who takes the time and trouble to master all the topics will have a good grounding in the basic elements of music theory and will be ready to enter the Associated Board Grade 5 Theory examination if they wish. This good grasp of the basics of musical literacy will also prove invaluable if studying for GCSE or A-Level Music or Music Technology. The book may be kept for future reference and used to refresh the memory if the student comes across anything they do not understand in the music they are studying. The contents of each Unit are detailed below. In addition, Units also contain numerous exercises to reinforce the concepts taught. At points throughout the book exercises are included which revise concepts taught in previous Units. Unit 2: Performance Directions words of similar meaning grouped together and presented with visual memory aids to aid memorisation. Unit 3: Pitch starts with a definition of pitch and stave notation. The five clefs are introduced, together with an explanation of their relationship to one another. The Unit ends with a definition of accidentals. Throughout this Unit, the only note-value used is a semibreve. This reinforces the concept that the position of the note-head on the stave defines pitch. Unit 4: Note-lengths and Rests introduces the basic note-values with their associated rests. The meaning and use of dots following notes and of ties is also taught. The Unit finishes with a detailed explanation of the correct way to write notes on the stave – accurate positioning of the note-head, rules regarding stem directions, how to draw beams accurately. Unit 5: Instruments and their Music gives instrument-specific performance directions alongside charts showing clearly for all orchestral instruments the name, pitch-range, clef(s) used and whether the instrument is a transposing instrument. Unit 6: Voices and their Music gives details of the different vocal ranges with a chart showing clearly the range of each voice and the clef used for music for that voice. A brief explanation of both short and open vocal scores is given. 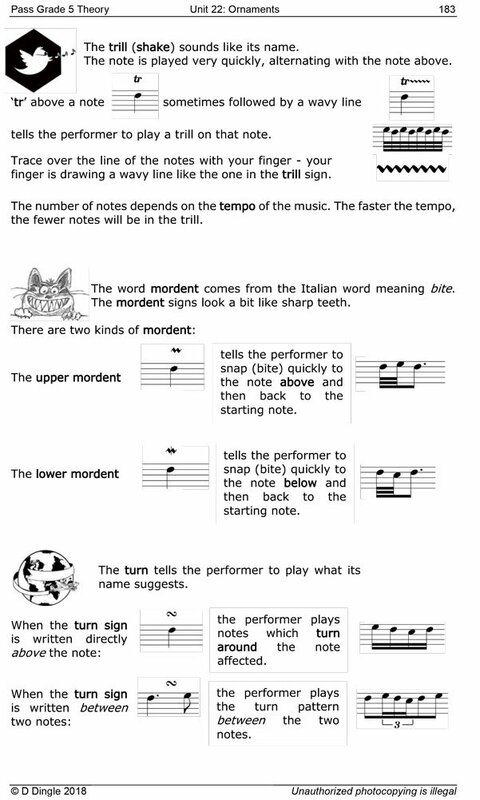 Unit 7: Rhythm, Beat and Tempo introduces and defines the terms Rhythm, Beat, Tempo, Bar-Line, Bar, Time Signature. Unit 8: Simple and Irregular Time explains the meaning of the two numbers in a simple time signature, followed by charts showing the rules for the correct grouping of notes and rests to define the beat. Unit 9: Compound Time explains the meaning of the two numbers in a compound time signature, followed by charts showing the rules for the correct grouping of notes and rests to define the beat. 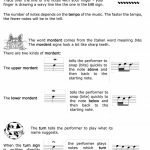 The second part of the Unit describes how to distinguish between music in simple time and music in compound time. Unit 10: Triplets and Duplets explains the use of triplets and duplets and gives different ways in which these can be written. Unit 11: Rewriting a Rhythm in a Different Time Signature further reinforces an understanding of rhythm by explaining how a rhythm can be written with a different time signature in notes of twice or half the value and the effect remains the same. This is followed by an explanation of the different ways a rhythm would be written when using a simple rather than a compound time signature and vice versa. Unit 12: Introducing Scales defines a scale and introduces the terms Major, Minor and Chromatic. The ways of labelling the notes in diatonic scales (degree, Roman numeral, technical names) are then introduced. 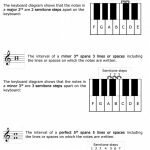 The concept of Key Signature is defined and mnemonics provided for learning the order of sharps and flats in key signatures, along with examples of the correct way to write key signatures on the stave. A brief description of Chromatic scales is given. 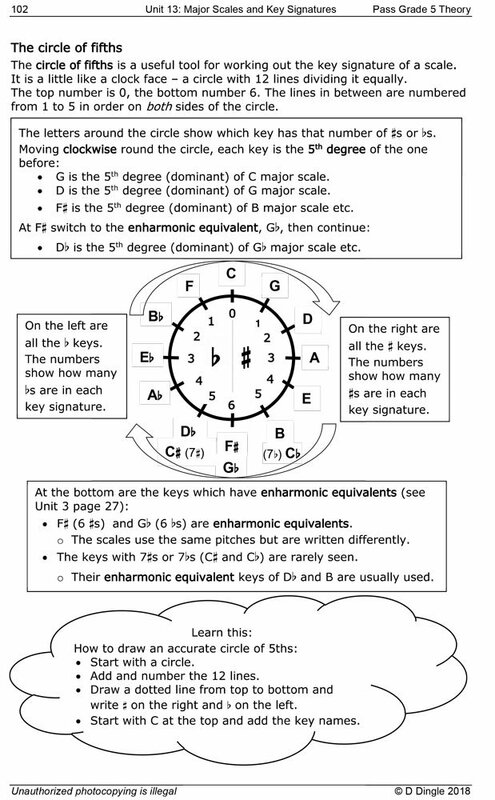 Unit 13: Major Scales explains the structure of the major scale and introduces the Circle of 5ths as a way of understanding the relationship between keys. 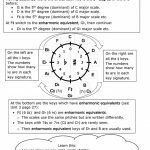 Unit 14: Minor Scales and Key Signatures provides clear diagrams demonstrating the concept of relative minors and majors. The Natural Minor scale is introduced first, followed by Melodic Minor and then Harmonic Minor. Diagrams show the correct use of accidentals in each. 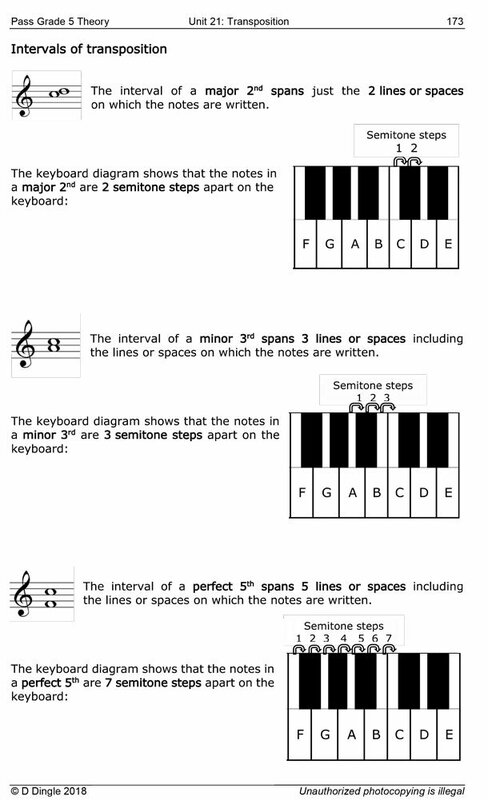 Unit 15: Chromatic Scales includes both how to write a chromatic scale correctly and how to recognise a chromatic passage in an extract of music. Unit 16: Intervals allows the student to progress steadily from assigning a simple numerical value to a given interval at the start of the Unit through to being able to give a full technical description by the end. Clear flow-charts illustrate the relationship between the various types of interval. Unit 17: Primary Triads introduces these basic building blocks of harmony and provides a foundation for the three Units which follow. Unit 18: Chords in Inversion uses clear diagrams to explain the concept and labelling of chords in inversion. A simple-to-use method is given for arriving at an accurate description of any given I, II, IV or V chord. Unit 19: Figured Bass introduces this alternative method for indicating the inversion of a chord and explains how to spot a (Ic V) progression in an extract. 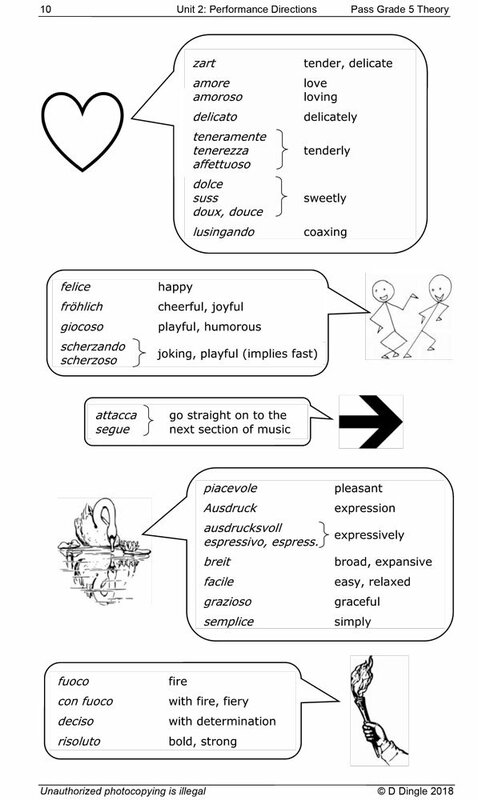 Unit 20: Phrases and Cadences introduces phrase structure. The unit then provides clear descriptions of the four cadences commonly used at the end of phrases along with instruction for how to select appropriate chords to harmonise the cadence points of a simple melody. Unit 21: Transposition begins with a definitions of concert pitch and transposition. Charts are provided summarising which instruments are transposing, together with their interval of transposition. Clear diagrams show the practical application of the intervals of transposition both with and without a key signature. Unit 22: Ornaments presents the most common ornaments used and explains the ways in which they can be played. Pictures are used to reinforce the meaning of each and to aid learning. Unit 23: Writing Your Own Music explains how all the topics studied come together when composing. A clear step-by-step example is given of the way in which a composer might approach setting a short poem to music. Four pages of blank manuscript paper are provided at the end of the unit for students to create their own music.